Property upkeep and maintenance is one of the biggest expenses for most home owner’s associations. But there is an easy way your HOA can save on maintenance and repair costs: a precast concrete fence. Precast concrete fencing, such as our RhinoRock Fence, is perfect for use around neighborhoods and subdivisions, and it can help your association save money over time. Keep reading to see how. Many HOAs, especially those in urban and suburban areas, have fences or walls around the border of the neighborhood. These walls can be great for keeping residents safe and happy and for preserving property values inside, but they often come with a lot of costly upkeep and maintenance. Wood fences, for example, need to be stained and treated on a regular basis, and they also need frequent repairs to replace damaged or rotten boards. Stone walls require less maintenance than wood fence. However, they are expensive and time-consuming to install, and they are heavy enough to cause problems on soft or uneven ground. The solution? Precast concrete fence. Unlike a wood fence, a precast concrete fence will last for decades without any special maintenance, and will be able to stand up to even the most extreme wind, rain, and heat. But unlike a stone wall, a precast concrete fence is fast and easy to install, and is light enough to use over any ground. Precast concrete fence provides the best balance between the strength and durability of stone and the flexibility of a wood fence. Over time it can save your HOA tens of thousands of dollars in maintenance and upkeep costs without any of the other drawbacks of stone walls. One of the best things about precast concrete fence is that it mimics the appearance of an old-world stone wall for a fraction of the price. Precast concrete fence is available in many colors and styles to suit the look of your neighborhood, and it won’t fade or degrade over time. Another benefit of precast concrete fencing over wood fences is how much stronger it is. Even though the precast panels only weigh 230 lbs apiece, they are extremely strong. They provide excellent security for residents, and they are able to stand up to heavy winds and snow/ice loads. Precast concrete fencing is also dimensionally stable – in other words, it won’t expand or contract with changing temperature or humidity levels. 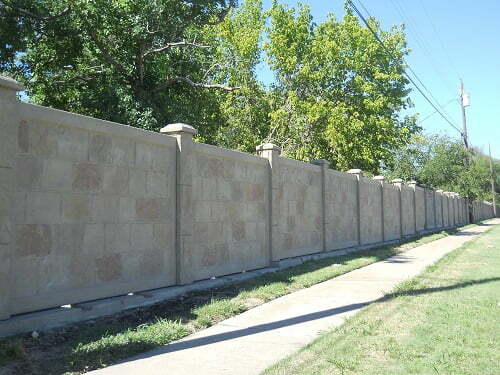 In the end, precast concrete fence is one of the strongest and most versatile fencing products on the market. A final benefit of precast concrete fencing is how easy it is to install. Because the precast concrete fence panels are so light, they can easily be brought to almost any installation site. They don’t require any heavy equipment to install and can easily be put in place without disturbing lawns or landscape features. This is a big benefit to HOAs replacing an existing fence as it avoids creating problems with damaged lawns or gardens in the neighborhood. If you want to help your HOA save money and spend wisely, you should consider a precast concrete fence from Future Outdoors. We’re the number one provider and installer of RhinoRock precast concrete fences in the Dallas metro, and we can help you decide if a RhinoRock fence is right for your HOA. Call 972-576-1600 today, or visit us on Facebook to see more tips and advice for all types of fence products.